Fig. 1. West Fork Millicoma Group Photograph. Elkhorn Ranch Field Trip, April 17, 2018. Photo by Anne Farrell-Matthews, Southwestern Oregon Community College (SWOCC) staff photographer. Back Row, Far Left (L-R): 1) Maxwell Richcreek (Forest Management); 2) Matthew Hofenbredl (Forest Management); 3) Carter Carr (Forest Management). Second Row (L-R): 1) Tasha Livingstone (SWOCC Forestry Instructor); 2) Cole Smith (Forest Management); 3) Cody Harkins (Forest Management); 4) Amy Kronsberg (Forest Management); 5) Scott Guthrie (Forest Management); 6) Matthew Smith (Forest Engineering); 7) Daniel Patton (Natural Resources); 8) Jerry Phillips (Field Guide/Consultant); 9) Bob Zybach (ORWW Field Guide/Editor). 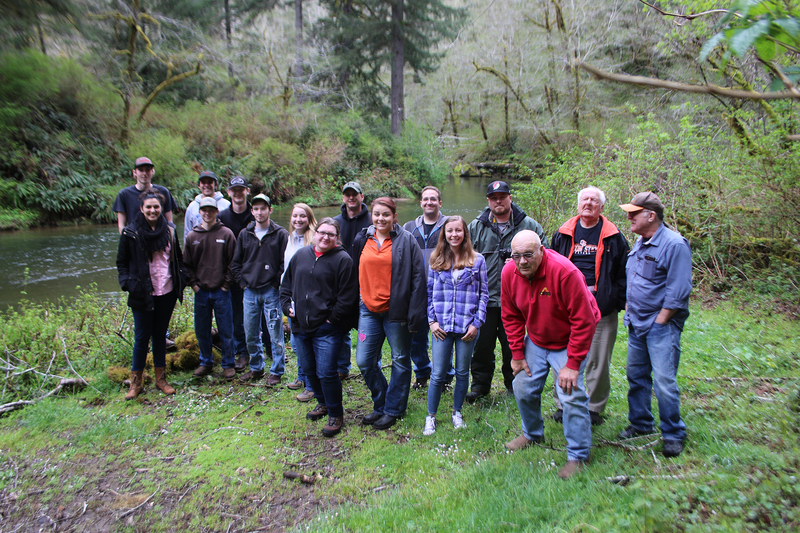 Front Row (L-R): 1) Maggie Boone (Forest Management); 2) Abby Richards (Forest Management); 3) Tara Boyd (Natural Resources); 4) David Gould (Field Guide/Consultant). Located along the southern Oregon Coast between Coos Bay and Reedsport, the Elliott State Forest covers approximately 90,000 acres of public land. Historically, this was deemed the first state forest within Oregon and all profits benefited local and state schools through Oregon’s Common School Trust Fund (Phillips 1998: 1-15). These lands are owned and set aside by the state and overseen by the State Land Board of the Governor, Secretary of State, and State Treasurer. Map 1. Location of Elliott State Forest in Oregon (Frochtzwajg 2014: 3). Recently, our class has taken the responsibility of creating a draft recreation management plan for this land because of the lack of revenue being generated. To gather our information, we traveled to six different destinations in and around the Elliott (see Appendix), in addition to online research. In detail it will describe the various aspects of recreational activities in and surrounding the forest and possible opportunities for profit. Our class of twelve students divided into four groups, where each student wrote one chapter, then combined them into the final plan.